Shrimp Cocktail Lettuce Cups are a delicious low-carb and gluten-free treat for dinner or game-day snacking. Use the Diet-Type Index to see more recipes like this one! 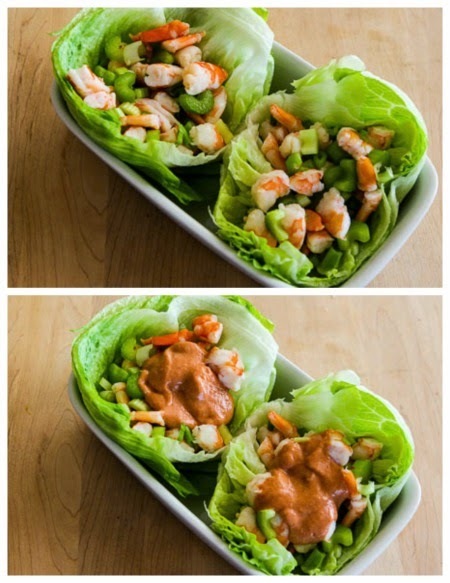 Click here to PIN Shrimp Cocktail Lettuce Cups! I grew up with a wonderful dad who thought shrimp was about the best possible food, which might explain my own fondness for all things shrimp. Another flavor I love is horseradish, the ingredient that gives that spicy kick to my low-sugar cocktail sauce. This fun new recipe for Shrimp Cocktail Lettuce Cups combines those ingredients in lettuce cups that would be a treat for a healthy low-carb dinner or game-day snack.When I tested out this recipe with Jake, we first mixed the cocktail sauce with the shrimp, celery, and green onion, but that watered down the sauce and we liked the lettuce wraps best with a dollop of sauce on top. I know shrimp isn’t a very budget-friendly ingredient, but I can’t say enough about how delicious this was, so I hope you’ll splurge on it sometime when you’re in need of a low-carb treat! But first, let’s talk a minute about the low-sugar cocktail sauce that makes this a low-carb recipe. I was excited back on 2009 when I discovered Heinz Low-Sugar Ketchup. But that product contains Splenda and fast forward five years and now I’m trying to avoid artificial sweeteners. If you want low-sugar cocktail sauce with no artificial sweetener, you may have to visit a health food store to find a natural “no sugar added” ketchup for this recipe, but there are quite a few good brands. And I promise you, once you taste these lettuce wraps, that trip to another store will seem worth it! Edit: Shrimp Cocktail Lettuce Cups was featured in the Top Ten New Recipes of 2015 (plus Honorable Mentions). Whisk together the low-sugar ketchup, mayo, lemon juice, and horseradish to make the cocktail sauce. Cut up one pound of cooked shrimp into pieces. Slice celery and chop green onions; then combine them with the shrimp in a bowl. Cut a head of iceberg lettuce in half and make “cups” by peeling off 2-3 pieces of lettuce. (I confess, I trim the edges with kitchen scissors to make nice-looking cups. 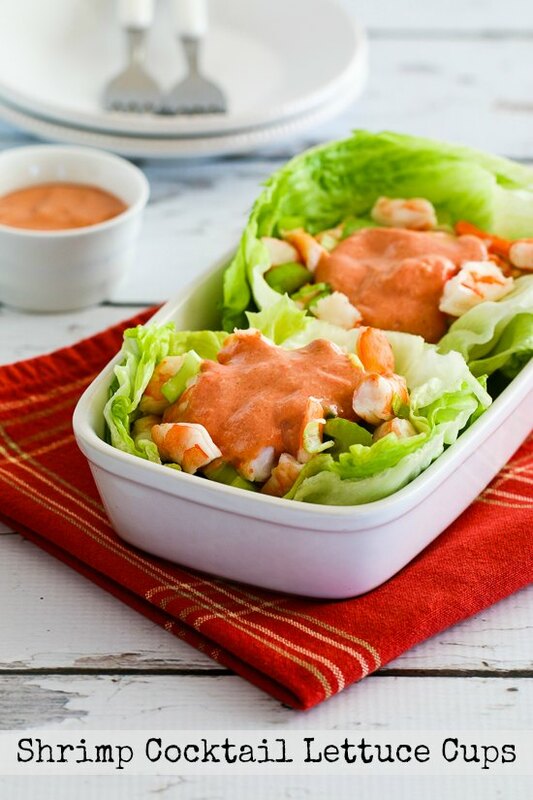 Fill the lettuce cup with desired amount of the shrimp/celery/onion mixture and top with a generous spoonful of sauce. Seriously, I could eat this at least once a week and I’d never get tired of it! Shrimp Cocktail Lettuce Cups would be delicious for dinner or game-day snacking. Remove shrimp from the refrigerator and let drain in a colander placed in the sink. Add more as desired until it’s as creamy/spicy as you like it. When shrimp have drained well, pat them dry with paper towels. Slice the celery into thin pieces and thinly chop enough green onion to make about 1/4 cup. Combine the shrimp, celery, and green onion in a bowl. Cut the iceberg lettuce in half, cut out the core, and discard any wilted or damaged outer leaves. 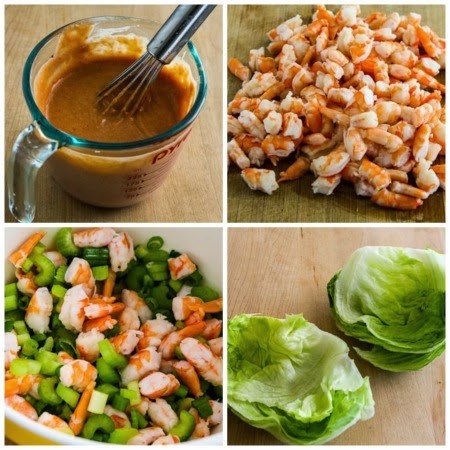 You may have to use two heads of lettuce to get enough cups to eat this much shrimp because sometimes the inner parts of the lettuce are too compact to make cups; just save those parts for salad. Scoop desired amount of the shrimp mixture into each lettuce cup and top with a couple of spoonfuls of the cocktail sauce. You can keep the ingredients refrigerated separately if this makes more than you’ll eat at one time. I used this low-sugar ketchup, but there are a few good brands. I love having fresh-frozen lemon juice for recipes like this. This recipe created by Kalyn to satisfy her addiction to shrimp with cocktail sauce. 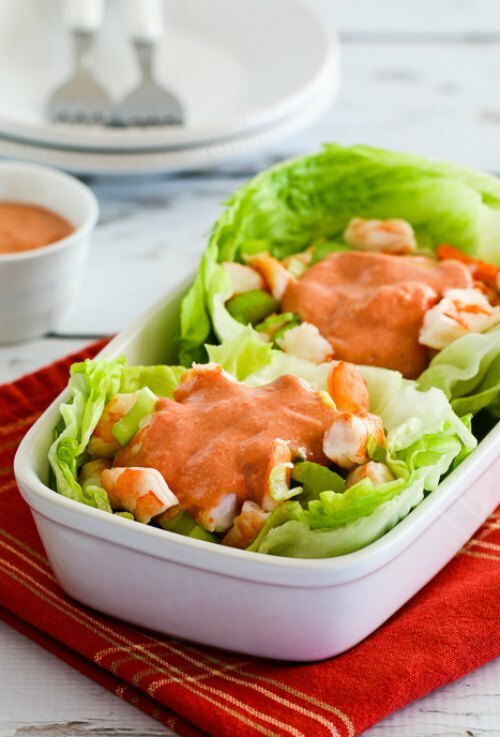 It’s important to use low-sugar or no-sugar added ketchup if you’re making Shrimp Cocktail Lettuce Cups for the South Beach Diet or you want it to be a Low-Carb dish. With that caution, this would be approved for any phase of South Beach or any other type of low-carb eating plan. Looks good Kalyn. Love horseradish-A wonderful way o kick up the flavor. Thanks; glad you like it. I LOVE horseradish! Yes, I could eat this once a week, too. I love anything with shrimp! Lydia, there's shrimp and it's spicy! Just up your alley. My mouth is watering just looking at this. Another great idea yet again! Thanks Anne, we loved them!